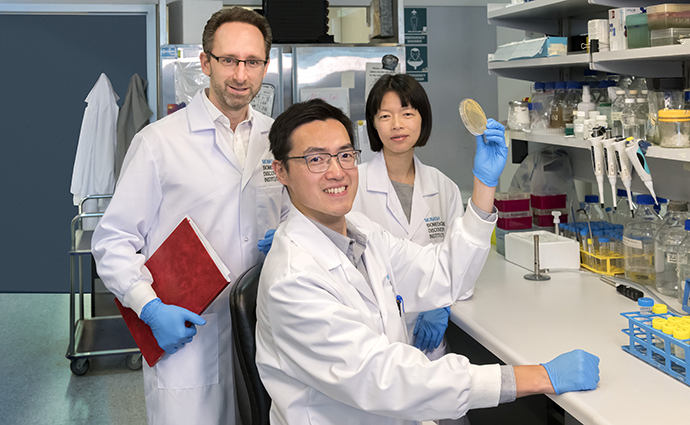 A multidisciplinary study led by Monash scientists has shown how one of the most important human superbugs, Staphylococcus aureus, can evade last-line antibiotics and the host immune system during a life-threatening infection. The findings uncover a novel strategy used by S. aureus (Golden staph), whereby it rapidly adapts its bacterial membrane to circumvent antibiotic and immune killing. These findings point to a potentially new therapeutic target for this significant bacterial pathogen. S. aureus can cause serious infection of almost any human tissue and mortality from treated infections is up to 35 per cent. It is estimated that around 7000 cases of S. aureus bloodstream infections occur in Australia each year, and about 25 per cent are caused by methicillin-resistant S. aureus (MRSA). Without the ability to use the antibiotic methicillin, treatment of MRSA infection increasingly relies on last-line antibiotics. The World Health Organization (WHO) has listed MRSA as a ‘high-priority’ pathogen that urgently requires the development of new antimicrobial agents. Professor Anton Peleg, from Monash University’s Biomedicine Discovery Institute (BDI) and Department of Infectious Diseases, Central Clinical School led the study, along with postdoctoral research fellow Dr Jhih-Hang Jiang. The work, which was recently published in PNAS, was performed in close collaboration with other Monash researchers including Dr Hsin-Hui Shen at Monash BDI, and Professor Graham Lieschke at the Australian Regenerative Medicine Institute. The work provides crucial insights into the relationship between antimicrobial resistance (AMR) and the ability of bacteria to cause human disease. How bacteria evade immune and antibiotic attack, and lead to complicated and persistent infections continues to be a challenge. “This research comes a step closer to identifying the ‘stealth’ mechanisms used by golden staph to promote its survival during serious infections,” Professor Peleg said. The researchers discovered a novel lipid membrane adaptation mechanism by S. aureus that prevented an important last-line antibiotic, known as daptomycin, from penetrating and disrupting the membrane. The lipid membrane changes also led to reduced neutrophil recognition and attack, and neutrophils are one of the dominant innate immune cells for controlling S. aureus. Together, these processes led to enhanced bacterial survival during infection. “Very little is known about bacterial driven factors that impact neutrophil function and migration to a site of infection,” co-first author Dr Jiang said. “Our work opens the door to assess one of the major components in the bacterial membrane, phospholipids, as a potentially important signal for neutrophils to detect and respond to.” he said. “We were able to apply exciting biophysical techniques to characterise the golden staph membranes, and found that the packing, organisation and density of lipids in the membrane impacted the mechanism of action of daptomycin,” co-first author Dr. Shen said. The application of this work is to investigate innovative bacterial membrane-based therapies for treatment of MRSA infections. By inhibiting these bacterial evasion mechanisms, scientists could possibly render golden staph more susceptible to antibiotics and immune cells, therefore leading to greater bacterial killing and improved patient outcomes. Read the full paper in PNAS titled Antibiotic resistance and host immune evasion in Staphylococcus aureus mediated by a metabolic adaptation.